A Master Database is highly important for an SQL server, as it holds the primary configuration details of the SQL server. The core information of master database is recorded in a physical file, called MDF files, whereas the parallel transaction logs are stored on to the masterlog.ldf file. This means the total user & login details, and the information of pointers to all the databases are stored on the master database. In brief, if anything happens to the master database, then you can’t start and productively work on your SQL server. How to Determine Whether Master Database Is Corrupt or Not? There are various situations in which your master database can go corrupt or missing. Power surge is one such reason that compels the SQL server to reboot, but after the rebooting process the SQL server may not start in this scenario. However, you can check the error log, as shown in the image below to verify the reason of corruption. In this situation your SQL server would refuse to start with the corrupt master database, so ideally the solution is to first rebuild the master database, then start SQL server and then restore the backup of the database. However, rebuilding the corrupt master database is a complex, tedious and time-consuming activity, and of course it is understood that you hold technical command over it. It can take a substantial amount of time and patience, as it involves reinstalling SQL server from scratch. Before moving towards the steps to rebuild, restore and recover your master database in SQL server, it is important to have a plan to deal with the issues of corruption and then follow a methodical approach to recover from it safely. Note: However, it is strongly recommended to take a full backup of master database, before rebuilding or restoring the master database – in order to avoid any chances of odd scenarios. Provide the desired collation setting along with the location of files of your database server. Also, you need to provide the x86 directory from the SQL CD and direct it to the local copy of your hard drive to obtain faster and convenient recovery. Upon verifying the information, simply hit ‘Rebuild’ button to let this utility build a brand new master database for your server. Then open SQL Server Configuration Manager and go to the Startup Parameter tab and specify –m in the parameter box to add and apply changes. Then restart the SQL server. Type the following syntax to rebuild master database in SQL Server 2005. The above mentioned procedure will help you to rebuild the corrupt databases (including model, msdb and master database) that are available on the same disk. STEP 2: Go to the SQL Server instance, and perform right-click operation and select “Properties” option. STEP 3: Select “Advanced” tab on the “SQL Server Properties” window. Go to Startup Parameters box, and then add “-m;” prefix to the already existing parameters. Note: Ensure that the prefix is then removed when the desired task is completed. 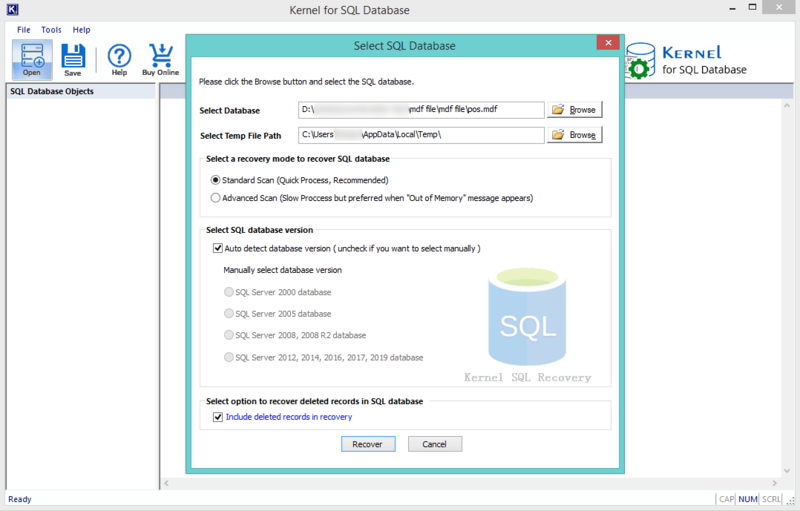 Then you can connect to the SQL server by running the following command to restore the database. 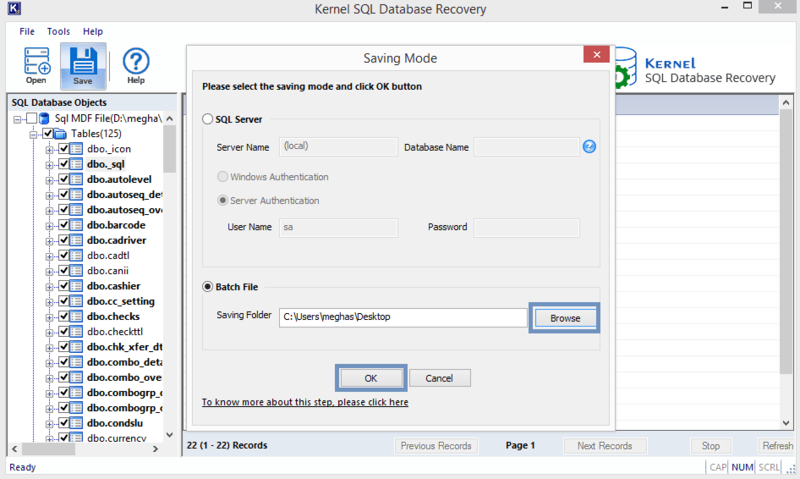 A third party MDF repair tool can be of great help to rebuild and restore damaged master database of SQL server. 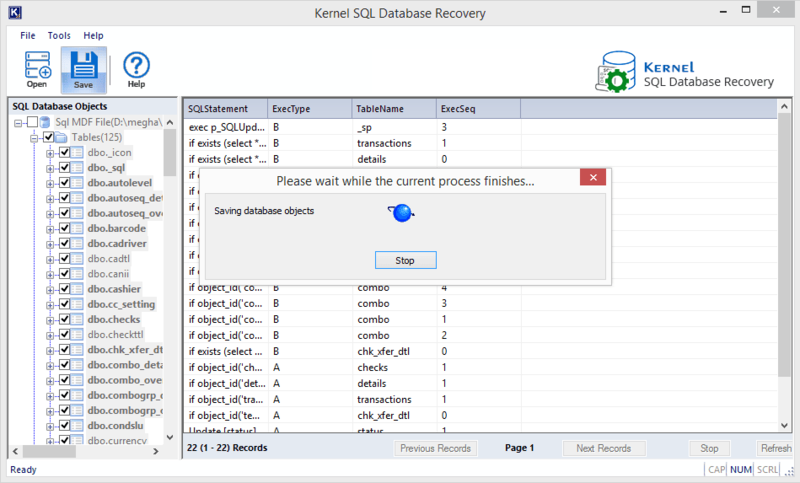 Kernel for SQL Database Recovery is a reliable third-party software that lets you to repair corrupt database and restore complete database objects (Triggers, Rules, Functions, Tables, Stored Procedure) with absolute data integrity. It takes no time in repairing MDF files (with batch file recovery) and restore the master database and system databases without taking any pain. The advanced software algorithms can automatically detect database version and lets you to restore the data while SQL server is still running. Let us know it’s working through screen displays with sequential steps. 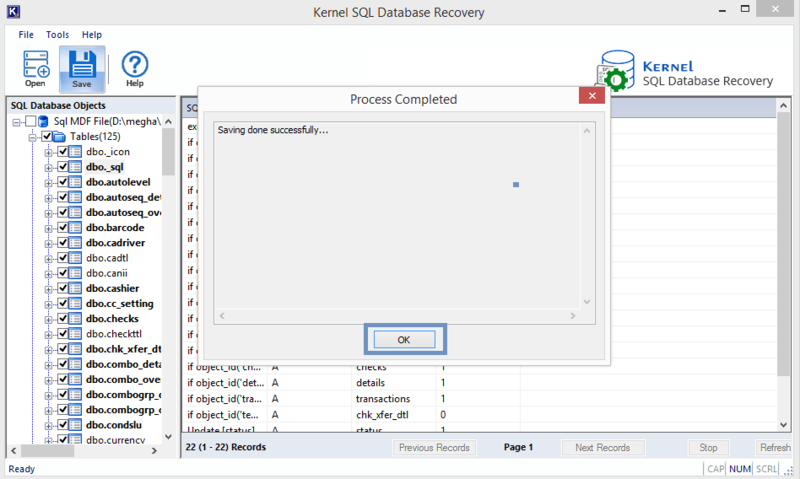 First, you need to install the SQL Recovery tool. Start the software application, click Browse to add your SQL Server Database file. 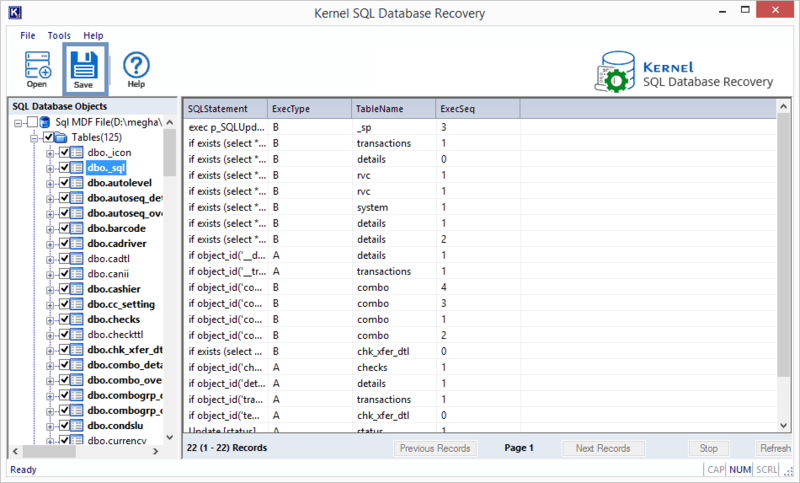 Then select the scanning option, SQL database version and click Recover option. All the SQL Database objects will get retrieved. Select the desired object to view its content. Select the desired objects from the left panel and click Save option. In the Saving Mode page, you have two saving options. Either use Live SQL Server or Batch File option. With Live SQL Sever option, you need to specify the details like server name, database name and with Batch File option, you need to specify the destination path for saving the batch file. Click Browse to add the saving path and then click OK. The SQL database objects saving process will get start. The saving of SQL database objects is shown as completed with the message. Click OK. Thus, your selected SQL database objects have got restored at the specified saving location. SQL Server database security is main concern for its administrator and in case they observe any symptoms of corruption, seeking instant solution is what they should do. 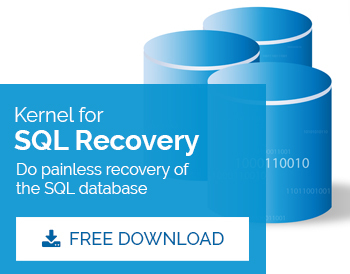 They can try rebuilding and restoring the SQL database manually of if it did not work, a helpful third-party tool Kernel for SQL Server tool with quick and automated solution is at your service.